The Nissen fundoplication provides extremely effective protection against gastro-oesophageal reflux and has become the benchmark antireflux procedure. Part of the appeal of fundoplication lies in the large number of ways in which it may be modified to accommodate the needs of individual patients. 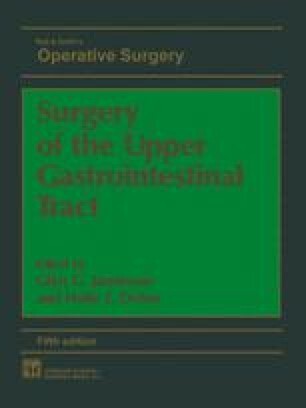 Most patients with gastro-oesophageal reflux and oesophagitis may be treated by transabdominal fundoplication. Intrathoracic (supradiaphragmatic) fundoplication may be defined as a variant of fundoplication in which the operation is performed via a left thoracotomy and the wrap is deliberately left partially in the chest. It was first described by Krupp and Rosetti1 and has proved extremely useful in the therapy of patients with acquired oesophageal shortening. Their overall results were excellent, but there were two episodes of gastric fistula in the early postoperative period that resulted in death. No details of these complications were provided. They reported four deaths from peritonitis in patients who had undergone transabdominal fundoplication, underscoring the point that none of the antireflux procedures are without complications. Many surgeons have regarded supradiaphragmatic fundoplication as the procedure of choice in the occasional patient with marked oesophageal shortening.